I was so delighted to be featured in the Sunday Times yesterday and listed as one of the Top 10 'design twitterati', and truly humbled to be mentioned alongside some of my blogging heroes including Holly Becker of Decor8 and Grace Bonney of Design Sponge. It made me think about what it is that I've found so captivating about this online world since I began on my blogging journey around three years ago. Blogging is empowering. It provides the freedom and opportunity to cultivate and express your own personal style and also to connect with a community of like minded people, not only from your own country but from all over the world. I really value the friendship, support and encouragement that the online community I've become part of provides. Amongst all of the wonderful interesting people I've come across online Pippa Kahn, is honestly one of the nicest, most supportive and most encouraging people I've 'met'. She's a prolific user of both Twitter and Pinterest and always seems to find the coolest stuff - I'm forever repinning her amazing architecture and design finds. Along with her partner Alan, Pippa runs the online 20th century design and antiques gallery, Fears & Kahn. I asked her to tell me a little more about her own very distinctive style and taste. Your online gallery has been established for 12 years now, and you have developed a very unique and distinctive style. How do you think your taste has evolved during this time? Our taste has definitely evolved since we started. In the beginning in 2000 we were in awe of 1960s space age design, anything with a plastic shell that was inspired by the use of new materials like fibreglass. We had never seen these amazing pieces in the flesh before, like the Elda chair by Joe Colombo, only in books and films, so this made us want to search them out. Since then we have gone through various phases from the Scandinavian organic wood look, with Danish designers like Hans Wegner and Arne Vodder, and the home grown talent of the likes of Merrow Associates and Robin and Lucienne Day, to an Italian glamour inspired by the designs of Gio Ponti and Willy Rizzo. Looking back we realised that all these styles had one thing in common - greatness. They didn't need to be separated by nationality or period, style is synonomous with great design from any era, so a mash up of nice pieces from any period is the only way to go. Do you sell at any of the antique or 20th century design fairs? We haven't done any 20th century fairs, these just didn't exist when we started, so instead we focused on our website and haven't felt a need to do them. We would however be interested in doing the Battersea Decorative fair one day. It seems to have a great reputation, and I'd enjoy meeting other Antique dealers that I've only met through cyberspace! What's your favourite item in the gallery at the moment? The Art Deco Spaniel, I love the quality of this ceramic life sized sculpture. Made in Italy it has been hand painted, and his face portrays such character! Favourite design object of all time? That's a tough question because of my constantly evolving taste, but I'd have to say something I use on a regular basis, our 1970's Desede DS-600 modular sofa. We were lucky enough to come across a brown suede 22 sectional version several years ago and knew that we had to have it even though at the time we didn't have the space, so we stored it away. We recently moved house and it now fits perfectly and takes pride of place in our living room. 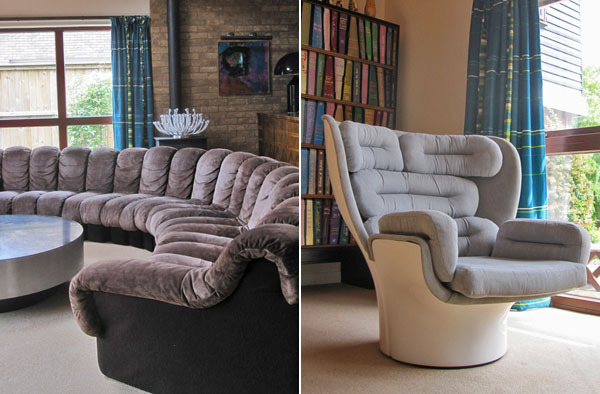 I love the fact that it looks stunning and is incredibly comfortable and we can both stretch out on it easily. Who would your ideal dinner party guests be?